Imagine having a virtual scrapbook that you can share with friends or co-workers. Share Board, an app developed by SID On, provides us with just that. 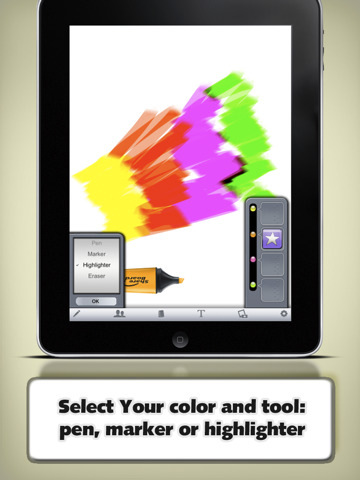 Everything you could possibly need to draw, edit, photograph, and sketch on your iPhone, iPod Touch or iPad. It is a bit expensive at $5.99, but you get much more than your money’s worth. Your use of this app is organized into sessions, which are locked with a username and password. Every time you open up Share Board you can either create a new session or continue with another. Whenever you create a session, the app keeps it organized in a Session Log. Make sure to connect your device with Bluetooth or local WiFi to use Share Board. The tools you are given include writing utensils—a pen, marker, highlighter—which all come in different colors—and an eraser. You can insert an image onto another image and rotate it or resize it, take a photograph from within the app, and export a picture you edited into your Photo Library. Another option is to insert a label, which you can do by touching the capital T on the menu bar. You simply type in your message and then you can place that label anywhere on your image. You have the ability to share any of the sessions you create via Facebook, your Photo Library, and email. VGA output support also comes with this package. Not only can you share your work with up to four other users, but every change you make to a particular session requires you to enter a password. Share Board definitely fits a niche missing in the app world. Sometimes you need to draw a mustache on a picture of a former girlfriend, sketch a trident and horns onto a photo of an ex-boyfriend or add silly captions to the pictures in your Photo Library. With the addition of the Share Board app to your collection, this is now possible. Your options are anything but limited; you can do everything from playing a game of hangman to adding your notes to a bar graph. 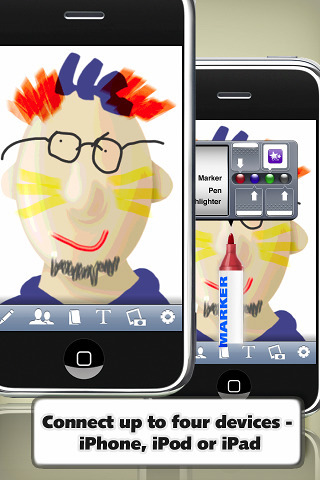 AppSafari review of Share Board was written by Vanessa Paszterko on August 8th, 2010 and categorized under App Store, Art, Developers, Fun, iPad apps, Notes, Productivity, Social, Universal, Utilities. Page viewed 9565 times, 2 so far today. Need help on using these apps? Please read the Help Page. shared board for ipad by kizu studio is better as i see.. it doesn’t limit to 4 people. since it is p2p, it is practically unlimited. I have a iPad and iPhone. I have installed Share Point App. May I know how to connect iPad with iPhone so that I can start using this App?